Belonging to that wonky sub-genre of William Shakespeare’s commonly works known as the ‘problem plays’, Michael Almereyda’s Anarchy (2014) is an intriguingly off-the-wall production which ultimately doesn’t quite gel. Cymbeline (Ed Harris) of the Briton Motorcycle Club goes to war with the Roman police department headed by Caius Lucius (Vondie Curtis-Hall). Meanwhile, his second wife (Milla Jovovich) plots to remove Cymbeline’s beloved daughter Imogen (Dakota Johnson), who is also endangered by trouble-making villain Iachimo (Ethan Hawke), who taunts her boyfriend Posthumus (Penn Badgley) into an ill-advised bet against Imogen’s fidelity. There’s a lot of toing and froing throughout Anarchy and the various threads and subplots are tangled and confusing, but the actors – especially Hawke, who brings some much-needed slime to his role – seem to be enjoying themselves, even as the story at no point threatens to become properly speaking engaging. If anything it feels like Shakespeare doing a pastiche of his own work, cramming in elements of earlier and more successful plays – the scheming trouble maker, the crossing dressing heroine, the fake death – and Almereyda isn’t afraid of allowing some of the more absurd elements of the plot come to the fore, although this further distances us from characters who don’t really care for in the first place. Ironically, updating Shakespeare now feels extremely dated. Baz Luhrmann’s Romeo + Juliet (1996) is probably the apotheosis of this approach in the cinema, though Almereyda’s Hamlet (2000), refitting the Dane’s tragedy in modern day New York, also had its sly charm, especially in Bill Murray’s slippery Polonius. 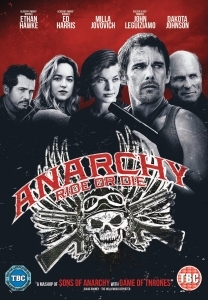 Here, characters are armed with guns and iPads; they Google plot points and take pictures with their iPhones, but the broader context of a motorcycle gang versus the police never truly convinces and when the two go to war, the limited budget means that it’s barely a scrap in a mini-mart car park. Harris looks a bit uncomfortable in his leather jacket, especially when he breakfast’s in a regal town house. What kind of Hell’s Angel is this? Set against the obvious low budget, the starriness of the cast is obtrusively distracting, with each doing a brief turn as if at a charity event. Bill Pullman contributes a scene as Posthumus’ posthumous dad and John Leguizamo plays Pisanio, a Kent-like servant. The trailer for the film boasts that Cymbeline is ‘Shakespeare’s lost masterpiece’, but this is simply not the case. Rather, the play is an inferior work plagued by its borrowings from much finer works. Intermittently entertaining and laudably short, for all its best intentions Anarchy is cursed by doing again what others have done better.